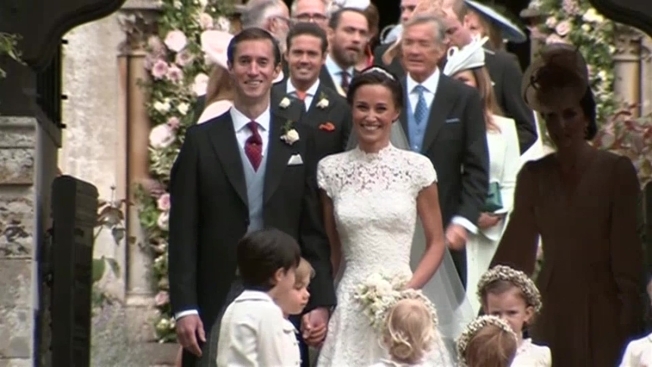 In what was seen by many as the society wedding of the year, Middleton and hedge fund manager James Matthews said their vows in a ceremony at St. Mark's Church in Englefield, west of London. Before the wedding, a crowd of well-wishers and reporters gathered outside the church grounds, hoping for a glimpse. The wedding party included Prince George, a 3-year-old page boy, and 2-year-old Princess Charlotte, a bridesmaid. Both are the children of the Duchess of Cambridge, Pippa's sister. Prince William and Prince Harry arrived together wearing formal morning suits. They seemed relaxed as they strolled into the church — perhaps relieved they didn't have a role to play in the wedding party. Matthews, 41, smiled broadly and sported elegant formal wear set off by a blue vest. Middleton, 33, came to the church accompanied by her father Michael in a vintage Jaguar convertible. She wore a custom wedding gown designed by Giles Deacon, a long veil by prominent hat-maker Stephen Jones, and a sparkly tiara. The dress was constructed with a high neckline and a corseted bodice, with draping to the front and a heart-shaped detail in the back. Deacon said the lace bodice was embroidered with pearl details over a layered organza-and-tulle underskirt. "(It was) a privilege to show the craftsmanship that my team produces in London and a real testament to Pippa's support of British fashion," he said. Father and daughter had a quiet moment together before entering the church, and church bells rang out as the couple emerged after saying their vows. They were fortunate in their timing — it rained during the ceremony, but the sun had returned before they stepped out of the church. Tennis star Roger Federer and his wife Mirka were among the guests, as was reality TV personality Spencer Matthews, the groom's well-known brother and one of the stars of "Made in Chelsea." The Duchess of Cambridge gracefully ceded the spotlight to her younger sister Saturday. 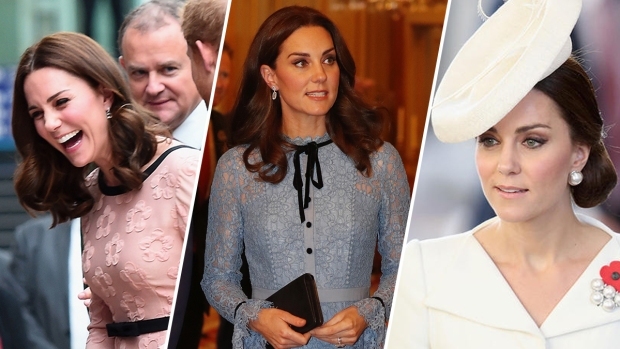 Kate wore a long-sleeved, blush pink Alexander McQueen dress and focused on making sure the young page boys and bridesmaids behaved — which they reportedly did. The bride's parents, Carole and Michael Middleton, had an elaborate glass marquee built on the grounds of their estate in nearby Bucklebury for the lavish wedding reception Saturday night. Guests were advised to bring two outfits so they could change after the wedding ceremony. The airspace above both villages has been closed to prevent intrusive press crews from flying overhead or launching drones to get video footage. There is some speculation that Harry will bring his American girlfriend, actress Meghan Markle, to the reception. Their relationship has become serious in recent months, with Harry speaking out to ask the press to respect their privacy. Middleton had several serious boyfriends before Matthews proposed last year. She has written a book about entertaining and columns for Vanity Fair while also working at her parents' lucrative "Party Pieces" business. Her figure-hugging gown attracted attention at the 2011 wedding of Kate and Prince William, sparking completely unfounded rumors that she was dating Prince Harry.